Spring is a time of renewal, fresh air, and homemade dog treats with greens and vegetables. It's also the perfect time to crank up the oven as there are still a few days of chilly mornings that your family will appreciate some extra warmth. Let's start with a versatile dog cookie that is full of greens, flavor and fiber. Collard Greens Dog Cookies can be made with collards, mustard greens, kale, spinach or turnip greens. The recipe uses gluten and grain free flour, but if your dog doesn't need those, you can use whole wheat flour. "My 3 pups loved them so much, each had one and licked the bowl, that I have decided to share the treats with all my friends' dogs and make more tomorrow. This was an easy recipe and so nutritious! Thank you!" 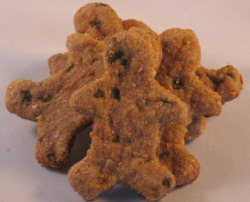 Our second choice for fresh and green dog treats is an easy, cheesy, spinach filled cookie. 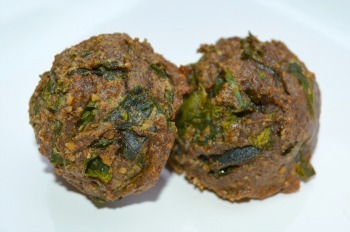 Spinach is heart healthy and you can use frozen spinach as a quick substitute in this dog treat recipe. You can make these Cheesy Spinach Dog Cookies gluten and grain free by substituting the cup of whole wheat flour for almond flour or your favorite GF flour blend. "I love this recipe and my 2 boxers, Ben and Emmy, love it more! I am making it weekly because they love it so much." 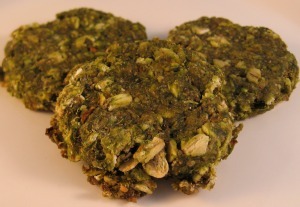 Lastly a lighter dog treat will round out our spring trio of healthy green dog cookies. Low Fat Green Bean Dog Cookies can be cut into shapes, like our gingerbread people, or you can scoop them into balls and flatten into cookie shapes for a quick treat. This recipe makes a big batch of green bean treats, so be sure to share the extras, or make a half batch. "I keep these on hand. Just made a batch and even when I'm mixing the ingredients, our dogs "know" I'm baking for them...they LOVE these." March 19th - 25th - Pet Poison Prevention Week. Why wait until the moment is upon you, go through your house now and remove or put away everything that your dog could get into. Use this cute infographic as a starting point. Print it out, keep it on the fridge and get to work clearing your home of dangerous items. Even better, download the free mobile app from the ASPCA. It will give you quick access to tons of potential harmful substances to avoid, plus their hotline number in case of emergency to quickly talk to a Vet. "I love the pictures, not only of the finished product, but the step by step pictures! The list at the beginning of tools you will need will come in handy for those of us who aren't experts in the kitchen. Also, I love that you listed how long it will last in the fridge or freezer! When you say easy recipes, you mean easy!!"